While forest resources could contribute to alleviating environmental and socio-economic pressures in the Philippines, these forests are rapidly dwindling. Traditionally, only one forestry agency (the Bureau of Forestry) was mandated to manage the country’s forest resources. But the energy crisis in the 1970s compelled the government to assign critical watersheds to other government agencies with direct stakes in specific watersheds, for example the National Power Corporation. Moreover, the enactment of the Local Government of 1991 required the devolution of substantial powers and functions from central government offices to Local Government Units (LGUs). This also expanded the focus of forest resources from traditional economic uses to a broader perspective including environmental and other services. The result was greater involvement by more stakeholders — primarily from the government and the private sector — in managing forest resources. Indeed, the services or utilization of remaining forest resources currently being claimed by multiple stakeholders usually leads to competing demands that require significant facilitation and coordination skills from the forest agencies belonging to the Department of Environment and Natural Resources (DENR). This creates a re-invention challenge for forest agencies to effectively facilitate and harmonize the competing and sometimes conflicting demands of the various stakeholders and forest managers. The degree to which this has been achieved is the subject of this study. Different tribes in the Philippines have been practising community-based forest management (CBFM) in their respective territories from the time the Spaniards first proclaimed the country Spanish territory in 1565. In 1863, the Spanish colonizers established the Inspeccion General des Montes (IGM), a forestry agency tasked to survey the extent of forest resources in the country. The Spaniards subsequently imposed the “Regalian doctrine” by which forests were claimed and owned by the Crown. Spain ceded the country to the Americans in early 1900 who subsequently adopted the Regalian doctrine. The Americans established the Forestry Bureau (later changed to the Bureau of Forestry). The School of Forestry in Los Baños was established in 1918 to develop human resources for the bureau. For some time, the Bureau of Forestry director was concurrently the Dean of the University of the Philippines College of Forestry at Los Baños. As government consolidated its ownership of forests and forest lands, the Bureau of Forestry allowed large-scale timber harvesting, processing and export of lumber as early as the 1930s. The lumber from dipterocarp trees became popular worldwide and was marketed as “Philippine mahogany”. The timber needs of local communities were legally addressed through the establishment of communal forests in the 1940s and concomitant permits were issued. When the Second World War ended, military equipment was converted for use in logging operations. After logging became mechanized and more Timber License Agreements (TLAs) were issued to concessionaires, the country turned into a major supplier of logs to the world market as early as the 1940s, peaking in the 1970s. Meanwhile, the ancestral ownership of the country’s forests and forest lands by indigenous peoples (IPs) was largely ignored and some of them slowly abandoned their claims and their traditional forest management practices. Mechanized logging simultaneously contributed significantly to deforestation. To accelerate tree planting, the Reforestation Administration (RA) was created in 1963 to hasten the reforestation of barren and denuded public lands. In 1975, the Revised Forestry Reform Code (Presidential Decree 705) was issued which re-organized the Bureau of Forestry, the Reforestation Administration, Parks and Wildlife Office (PWO) and the Southern Cebu Reforestation and Development Project (SCRDP). These agencies were merged to become the Bureau of Forest Development (BFD). 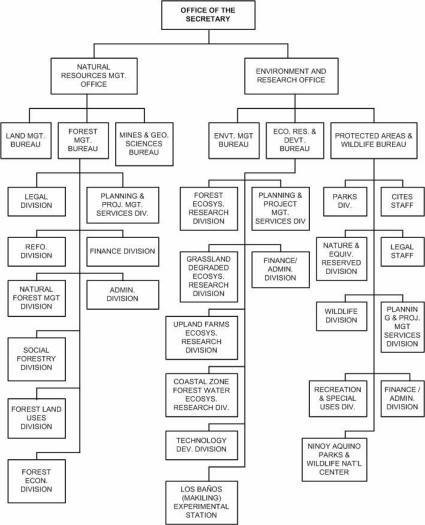 This could be interpreted as a useful development as the different aspects of forest and forest land management were placed under one office with a line function. In the 1970s, the persistent “problems” of shifting cultivation (kaingin) and illegal encroachment of forest lands induced the BFD to launch various programmes and projects such as Forest Occupancy Management (FOM), Family Approach to Reforestation (FAR), Communal Tree Farm (CTF), Agro-forestry Farm (AFF) and Tree Farm (TF). In 1985, the Wood Industry Development Authority (WIDA) was created; it took over the BFD’s regulatory functions for forest resource management and processing of forest products. The timber management and forest utilization units at the BFD’s national, regional and district offices formed the core units of WIDA at national and area levels. The People Power revolution of 1986, also dubbed the “EDSA I” revolution, introduced many changes in forest agencies. Mrs Corazon Aquino succeeded Ferdinand Marcos as President of the Philippines and appointed former Senator Ernesto M. Maceda as Minister of Natural Resources. Maceda brought a community development undercurrent to the Ministry of Natural Resources (MNR) and supported its social forestry programme. Attorney Fulgencio S. Factoran, Jr., a former cause-oriented lawyer, became minister in the late 1980s. Restoring decency and professionalism in the administration and providing a clear direction, Secretary Factoran inspired many NGOs and people’s organizations (POs) to partner with, and support, the DENR. The department established NGO desks at the central and regional offices for recognizing and accrediting NGOs and POs. Later they were used as the basis for entering into contracts with many of them for community organization, reforestation and other departmental development activities. In 1987, during Secretary Factoran’s term, President Aquino issued Executive Order (EO) 192 renaming the MNR as the Department of Environment and Natural Resources (DENR) and re-organizing subordinate bureaus and offices. The responsibilities for implementing the various forestry programmes and projects at the district level, formerly held by the BFD district offices, were transferred to Community Environment and Natural Resources Offices (CENROs). CENROs were to be supported by the Regional and Provincial Environment and Natural Resources Offices (RENROs and PENROs). Executive Order 192 of 1987 consolidated several government agencies dealing with environmental concerns under a single department, the DENR (Figure 1). As spelled out under EO 192, the Forest Management Bureau (FMB), the Ecosystems Research and Development Bureau (ERDB) and the Protected Areas and Wildlife Bureau (PAWB) are the DENR bureaus with direct forestry-related functions. The Forest Management Bureau (FMB) is under the Natural Resources Office, headed by an under-secretary, while the ERDB and the PAWB are placed under the Environment and Research Office headed by a second under-secretary. Although these offices are considered staff bureaus, there is a “tacit agreement” that their directors can have “direct links” with regional technical directors and sectors especially on matters related to sector instructions and compliance reports. 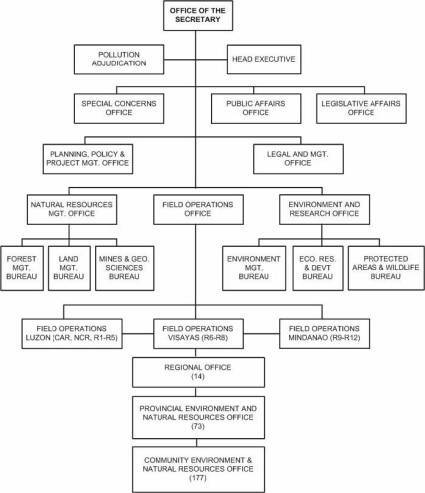 Figure 2 shows all of the three forestry-related bureaus — the FMB, ERDB and PAWB — with the functional divisions that help them to carry out their roles as staff bureaus for the DENR secretary. Their roles are mainly focused on forest policy formulation, setting of standards, quality control and serving as advisers to key DENR officials, particularly to the secretary. 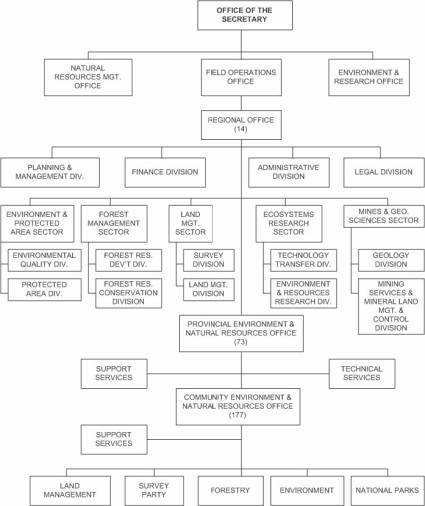 The integration of the different sectors outside the Office of the Secretary occurs at various levels of the Field Operations Group — from RENRO down to CENRO, as depicted in Figure 3. At the regional level, the regional executive director (RED), who is considered a generalist, is assisted by five regional technical directors (RTDs) including the three RTDs for forestry-related sectors. PENROs are each assisted by a forestry specialist and provide administrative and financial support to CENROs and their operations. PENROs also serve as the strategic link of the DENR to the different heads of local and national agencies and civil societies operating in the province. CENROs are considered to be the front-liners and at the cutting edge of the DENR in terms of managing the environment and natural resources, including forestry. CENROs are assisted by different forestry specialists in the implementation of various forestry programmes and projects within their areas of jurisdiction. Reforms implemented under EO 192, established the following roles, functions and office divisions for the FMB, ERDB and PAWB. undertake studies on the economics of forestry and forest-based industries, including supply and demand trends at local, national and international levels, identifying investment problems and opportunities, in various areas. assist the secretary in evaluating the effectiveness of the implementation of the integrated research programme. assist the secretary in monitoring and assessing the management of the Integrated Protected Areas System and provide technical assistance to the regional offices in the implementation of the programme for these areas. Since 1987, the DENR has undergone periodic re-invention as a result of significant and frequent changes in policy direction. This section discusses related issues on CBFM, devolution of forestry powers and functions to the LGUs, granting of autonomy to Muslim Mindanao, transfers of supervision of certain forest lands to other government agencies and corporations, recognition of the rights of IPs and the decline of the logging industry. One of the factors that induced the DENR to re-invent itself was the re-emergence of CBFM as a leading management strategy and approach. CBFM had been widely practised in early times in the Philippines, but the practice was marginalized when the Spanish introduced the Regalian doctrine in the fifteenth century. Significant developments since the 1950s re-established the CBFM agenda among forest management practices in the country. In 1967, during a Kaingin Management Conference in Los Baños, Laguna, participants agreed that kaingin was not simply a forestry violation but rather was the aggregate result of socio-economic, cultural and political factors. Seven years later, the MNR awarded the first Community Forest Lease Agreement (CFLA) to the Ikalahan Foundation, an IP association in Nueva Viscaya. Also, in the 1970s the Paper Industries Corporation of the Philippines (PICOP) based in Surigao del Sur encouraged and supported agroforestry on the idle, small private landholdings surrounding its concessions to protect them from kaingineros. In four years, the pioneer tree farmers obtained cash payments from the pulpwood logs of their falcata (Paraserianthes falcataria) trees sold to PICOP. Within ten years, some 1 800 landowners had established about 30 000 hectares of falcata woodlots around PICOP concessions (Lansigan 1994). In 1984, the social forestry component of the Central Visayas Regional Project (CVRP), a World Bank-funded regional project on decentralization and rural development, started organizing forest occupants in Negros Oriental into Forest Steward Associations (FOSAs). They were assigned areas to protect and manage and were allowed to utilize the dead trees for commercial purposes as an incentive. The policy was disapproved by the BFD director in 1985, but re-instated by Minister Maceda in 1986. The permits were ultimately suspended, however, when it was discovered that trees were intentionally being girdled/killed so that they could subsequently be “legally” cut to produce lumber. The inconsistent administering of forest harvesting under the CVRP project and the anomalies occurring under the programme led to a shift in focus for FOSAs. Priority was shifted to “contract reforestation” under which FOSAs were redirected to work on forest rehabilitation efforts instead of utilization. An important lesson from the CVRP was that raising the incomes of forest dwellers does not necessarily raise their standard of living. They need to be trained on how to effectively manage personal and community finances. The DENR drew lessons from these cases and pursued its CBFM direction by implementing the Community Forestry Program (CFP), the Regional Resource Management Project (RRMP) and the Low-Income Upland Communities Program (LIUCP). It achieved more policy support with the issuance of EO 263 by President Ramos in 1995, adopting CBFM as the national strategy for sustainable forest management. It promulgated Department Administrative Order 96-29 known as the Community-Based Forest Management Program (CBFMP) to implement EO 263 in 1996 and renamed the Integrated Social Forestry Division within FMB as the Community-Based Forest Management Office (CBFMO). The implementation of the DENR’s CBFM programme has been hampered mainly by budgetary constraints and limitations in technical staff required to continuously coach, train, guide, lead and enable the CBFMA holders. Each PO should ideally have one CBFM technician assigned in the area. This means that the DENR would need 5 000 technicians for the country’s potential 5 000 CBFM projects. Fortunately, the participation of LGUs and NGOs helped solve this limitation assisted by donors who provided grants directly to POs or to their assisting NGOs. Currently, many bilateral donors are supporting CBFM programmes and projects — USAID, AusAID, CIDA, UNDP, GEF, GTZ and the EU. The provinces, cities, municipalities and barangays (villages) of the country constitute the LGUs. They were given substantial powers and responsibilities to manage local affairs with the passage of the Local Government Code (Republic Act 7160) in 1991, including forest management functions that were devolved to them by the DENR. In the 1980s, a handful of LGUs managed their natural forest resources. With these provinces effectively handling the needed community organization and mobilization tasks, the DENR’s forest protection and developmental activities became more effective. Poverty incidence (from a high of approximately 50 percent in 1995 to a low of approximately 11 percent in 2003) and forest-use violations in these provinces decreased markedly. It was incumbent upon the DENR to devolve forest management functions specified in the Local Government Code. Despite no concrete criteria for LGU readiness, the DENR did proceed with devolving these functions to LGUs. Among the devolved functions was the management of communal forest and community watersheds of not more than 5 000 hectares and all the locally funded social forestry and CBFM projects. The LGUs were requested, although not forced, to create and operate their own Environment and Natural Resources Offices (ENROs) to manage the devolved functions. Many of the DENR staff devolved to LGUs were those who had earlier been trained in community development and social forestry. Unfortunately, the DENR failed to provide the technical assistance needed by LGUs on how to properly organize and supervise these staff. Some LGUs even considered the devolved functions as an “expense” so they assigned the devolved staff to income-generating activities, such as the monitoring of sand and gravel extraction or even in the collection of market taxes, instead of the social forestry activities for which they had been well-trained. In 1998, the DENR and the Department of the Interior and Local Government (DILG) issued Joint Memorandum Circular (JMC) No. 98-01. A joint committee was created to facilitate the implementation of the circular which called for the establishment of communal forest and community watersheds and the conducting of Forest Land Use Planning (FLUP) in the concerned LGUs. The DENR and the LGUs experienced a number of failures with regard to devolved forestry powers and functions. Some DENR/FMB officials and staff were uncomfortable in dealing with politicians and LGU officials who were perceived to be arrogant. On the other hand, some LGU officials were perceived to be resentful to DENR/FMB officials who had been given considerable authority for the management of forest resources when they had not been elected by the people. These issues hindered effective communication and the ability to derive maximum benefits from devolution. Further DENR re-invention could result in improved linkages with the LGUs. Empowered LGUs, such as those in the provinces of Nueva Viscaya and Palawan, have demonstrated that they can make major contributions to the sustainable management of forest resources through partnerships with the DENR. They can also sometimes provide funding for the rehabilitation, development or protection of forest resources. In this context, the DENR’s forestry mandate could be easier to realize if these partnership approaches were expanded. In 1991, a new law created the Autonomous Region in Muslim Mindanao (ARMM) which encompassed the provinces of Lanao del Sur, Maguindanao, Sulu and Tawi-Tawi. Except for issues concerning finance, foreign affairs and national security, the power and authority vested in the national government were turned over to the ARMM. The DENR transferred its national management mandate to the predominantly Muslim provinces of the ARMM. Thus, there was a decrease in area covered by the DENR nationally but this was juxtaposed by a decrease in budget and staffing. It should be noted that the ARMM’s DENR patterned most of its administrative orders and circulars on those of the national DENR. However, there remains a need for increased collaboration between the two entities, especially with regard to experience sharing, technical training and concomitant capacity building in ARMM on policy-making and international agreements related to forest management. The establishment of the ARMM was, nevertheless, a breakthrough and a milestone in government bureaucratic procedure. The ARMM DENR, assisted by the USAID-supported Environmental Governance (ECOGOV) project, has worked successfully for the passage of its own Sustainable Forest Management Act (SFMA). This is a credit to ARMM DENR. In contrast, the national version of the SFMA, which the national DENR submitted to the Philippine Congress in 1988 still has not been enacted into law up to this day. In July 1987, President Aquino issued Executive Order (EO) 223 vesting in the Philippine National Oil Company (PNOC) the jurisdiction, control, management, protection, development and rehabilitation of watersheds where the PNOC had geothermal projects, plants and properties. In the same period, President Aquino issued EO 224 vesting in the National Power Corporation (NAPOCOR) the complete jurisdiction, control and regulation of watershed areas and reservations surrounding its power-generating plants and properties. These two EOs effectively transferred specific forest lands from the control and management of the DENR to the PNOC and NAPOCOR. Placing watersheds that supported hydroelectric power generation under the jurisdiction of NAPOCOR and areas sustaining the productivity of geothermal fields under the PNOC was practical and effective. Both had obligatory reasons to protect these watersheds and the necessary funds to do so. It made them directly accountable. The resistance of IPs to government moves that would negatively affect their culture and ancestral lands has caught the attention of the media and various NGOs. A classic example was the resistance of the Kalingas to the government’s plan to construct the Chico dam that would have flooded tribal settlements and burial sites of ancestors. One of their leaders, Macling Dulag was murdered in the process. Their cause was pursued by many NGOs and regularly featured in the media. The groups were not only eventually successful in stopping the dam’s construction, but more importantly contributed to the ultimate passage of the Indigenous Peoples Rights Act (IPRA). Years before the IPRA was passed, the DENR had already received many requests, petitions and demands in different forms directly from IPs or from individuals and groups supporting their cause for recognition of IP claims to their ancestral lands. The DENR responded by creating the Indigenous Communities and Ancestral Domain (ICAD) Division within its Special Concerns Office. A District Administrative Order was issued for the purpose. It facilitated the survey, processing and issuance of Certificates of Ancestral Claims Domain (CADCs) to IPs. Preparation of corresponding Ancestral Domains Management Plans (ADMPs) was also facilitated by the DENR. Meanwhile, concerned NGOs and other groups also stepped up their support for the IPs and pushed for the issuance of a law to cover these concerns. IPRA (Republic Act 8371) was finally approved by Congress in 1997. It mandated the creation of the National Commission for Indigenous Peoples (NCIP). Among other tasks, this new office initiated work to issue Certificates of Ancestral Domain Titles (CADTs) to IPs. The NCIP, however, did not start from zero. It made use of the CADCs issued by the DENR that greatly facilitated its issuance of CADTs to IPs. The DENR signed a Joint Memorandum Circular with the NCIP in 2003 for the harmonization of the “Implementation of the IPRA and Environmental and Natural Resources Laws and Policies”. The recognition and promotion of the rights of IPs enabled the government to redress injustices done to them by previous governments, particularly the denial of tribal ownership of forest lands and accompanying resources and the disruption of indigenous forest management practices. Returning their traditional assets and the freedom to practise indigenous forest management were moves undertaken by the government, but many of the young IPs had already lost indigenous knowledge and skills. The elders of some of the IPs, with the assistance of the government, are making efforts to re-establish their former rich history and practices. The IPs are potentially very capable partners in protecting and managing the forest lands allocated to them in the form of CADTs. By 2006, only 14 TLAs covering 0.72 million hectares (from a former high of 254 covering 8.59 million hectares) were expected to continue. There were various reasons for the reduction of TLAs: non-renewal of expired TLAs, suspension or cancellation due to violations of forest laws, inclusion of the concession areas in the Integrated Protected Area System (e.g. Samar Island) and voluntary surrender of the TLAs by their holders (e.g. Nasipit Lumber Company and Anakan Lumber Company in Mindanao). Other TLAs were cancelled to conserve the remaining forest although the opposite occurred in Negros Oriental where there was massive forest destruction to make way for sugar­cane plantations and other agricultural activities. Other TLAs were affected by a DENR policy in the late 1980s where logging was banned within the old-growth/virgin forest stands, areas with more than 50 percent slope and areas located above 1 000 metres in elevation, as in the case of the TLAs operating in the pine forests of the Cordillera region. The 1987 Constitution specifies only three modes through which the private sector can utilize the country’s natural resources: production sharing, joint ventures and co-production agreements. Moreover, the constitution also allows the state “to engage directly in the utilization of natural resources”. A TLA does not conform to any of these four modes. Therefore, in lieu of TLAs, the DENR formulated Industrial Forest Management Agreements (IFMAs) and Socialized Industrial Forest Management Agreements (SIFMAs). These two new instruments were designed to provide modes for forest management and production sharing. The IFMA is an improvement over the previous TLA system because: (a) maximum of 40 000 hectares is granted as concession areas compared to 100 000 hectares for TLAs; (b) the IFMA holder has to practise reforestation for as long as two years before being allowed to start cutting operations within natural forests; (c) IFMA holders are required to involve the communities within and around their concessions in defining priority areas for development activities. The SIFMAs on the other hand, allow small entrepreneurs or individuals to partner with the government in the management and development of suitable forest lands. The area covered, although not exceeding 500 hectares, is sufficient for small-scale operations. This also addresses the problem of equity in the development and utilization of forest resources. This is another arena where DENR re-invention could be more effective. The smaller coverage of IFMAs means that there are more entities to monitor and evaluate, assist and manage. Should the DENR be successful in transforming the forestry department of each IFMA holder into a “de facto mini DENR”, conscious of its natural resources and forestry responsibilities, it can carry out its mandate despite limited budget and personnel. There is potential for more local participation, especially in the uplands, in assisting IFMA and SIFMA holders in their various development activities. Assure the availability and sustainability of the country’s forest resources through judicious use and systematic restoration or replacement, whenever possible. Increase the productivity of forest resources in order to meet the growing population’s demands for forest resources. Enhance the contribution of forest resources towards achieving national economic and social development. Promote equitable access to forest resources for the different sectors of the population. Conserve specific terrestrial and marine areas representative of Philippine natural and cultural heritage for present and future generations. Assuring availability and sustainability of the country’s forest resources. Limited access to and use of forest resources are allowed through the issuance of permits, leases or agreements in which there are corresponding responsibilities. In contrast, “open access forests” lead to forest destruction. Table 1 shows that 7.56 million hectares of forest lands were open access in 1997 while 3.92 million hectares were under forest management. If the eight TLAs scheduled to expire in 1997 and the six TLAs expiring between 1998 and 2005 (Table 2) had closed as scheduled, an additional 0.68 million hectares would potentially have become open access lands if not brought under secure tenurial instruments. This would mean that about 8.24 million hectares were likely to have had open access status by 2005. Source: 1997 DENR Strategic Action Plan for CBFM reflected in DENR Memo Circular No. 97-1. Source: 1997 DENR Strategic Action Plan for CBFM reflected in DENR Memo Circular No. 97-13. Table 3 shows that the forest cover of the country has been decreasing consistently. In the absence of data for the period of 1987 to 2005, the two entries for 1990 and 2001 can be used to form an estimate. Within the 11-year span, the forest cover of the country decreased from 6.7 million to 5.4 million hectares — a loss of about 1.3 million hectares for the period, or an average loss of about 118 000 hectares per year. Set against the annual reforestation average of 63 377 hectares, overall forest cover is decreasing. Source: Revised Forestry Master Plan. Increasing the productivity of forest resources. Productivity can be enhanced by increasing forest area. If area cannot be increased, then the species used should have a shorter rotation period before harvesting. Or it should yield greater volume at harvesting within the same time span compared to the commonplace species. For paper and light construction needs, this has already been accomplished by planting species like Paraserianthes falcataria and Gmelina arborea, which yield more volume in 10 to 15 years than dipterocarps that require a much longer periods to mature (e.g. 35-year-rotation periods). But for products requiring good quality timber — mainly from the dipterocarp species and other premium hardwoods such as Pterocarpus indicus and Vitex parviflora — there is also potential for productivity gains. Although timber stand improvement (TSI) practices have been used in some concession areas covered by TLAs, conclusive findings on improved stand yields are lacking. Most of the continuous forest inventory (CFI) plots, where data have been accumulated for decades, were affected by illegal logging when the TLAs were cancelled; others were lost to forest fires and kaingin farming. Genetic engineering and biotechnology have not been used commercially for trees and other forest crops. Enhancing the contribution of forest resources in achieving economic and social development. Table 4 reveals that forestry’s contributions to GNP and gross value added (GVA) have been decreasing since 1975. This is attributable to diminishing forest resources, fewer TLAs and the corresponding reduction of harvested forest products. This would not be so detrimental if the reduction of forest products, especially timber, were not so great. Value addition can compensate for forest resource reduction to some extent. However, major reductions in timber production significantly affect forest and wood-based firms such as the furniture industry. Labour-intensive in nature, the entire furniture industry provides employment to approximately 1 800 000 people. It directly employs about 500 000 workers and indirectly another 300 000 workers. Subcontracting work involves approximately another million people. Manufacturers use a varied mix of raw materials, but it is estimated that about 80 percent of furniture components are wood or other forest-derived materials. The total value of forest-based furniture exported in 2004 alone reached approximately US$229 million, or PHP12.8 billion (CFIP 2005). Hence, if the supply chain were to be cut, a staggering loss of income would result, due to the loss of exports and sales. Subsequent economic and social dislocation could be severe, considering that about 10 percent of the country’s population is dependent to one extent or another on the furniture industry (assuming each worker contributes to the livelihood of an average of five persons per household). Promoting equitable access to forest resources. As early as 1982, through the ISFP, more equitable access to forest resources had been pursued by the department. This was re-inforced by subsequent DENR programmes and projects. One of the best examples was the Community-Based Forest Management Strategy (CBFMS) — Executive Order (EO) 263, July 1995. It adopted CBFM as the national strategy to ensure the sustainable development of the country’s forest land resources and provided mechanisms for its implementation. According to a field review of 47 CBFM sites (Acosta et al. 2005) already more than 1 500 POs had been awarded CBMFAs nationwide, encompassing approximately 1.5 million hectares. Pursuant to the 1987 Constitution, the issuance of TLAs was prohibited. The DENR responded by developing tenure instruments consistent with Constitution provisions such as IFMAs and SIFMAs. The reduction of maximum area coverage for each tenure instrument partially addressed equity issues by allowing more access to forest resources by a greater number of people. The passage of the IPRA law also helped promote equitable access to forest resources because substantial areas of forest and forest lands were turned over to the IPs through the NCIP. The IPs were issued Certificates of Ancestral Domain/Land Titles to their ancestral lands that gave them authority to use these lands according to indigenous practices. The passage of the ARMM law (R.A. 9054) also contributed to the promotion of access to forest resources as the ARMM DENR is allowed by law to manage its forest resources directly, in accordance with the existing Philippine Constitution and national laws. The residents of the ARMM naturally have priority to utilize their forest resources. The National Integrated Protected Area System (NIPAS) Act helped to promote equitable access to forest resources through the establishment of the protected area system. TLAs within protected areas were cancelled or suspended and logging operations were prohibited. But local communities were still allowed to utilize forest land and resources, particularly where they were within multiple-use zones of the protected area. Conserving specific terrestrial and marine areas. Formerly, the DENR had facilitated the issuance of Presidential Proclamations (PPs) or EOs declaring specific forest lands as watershed reservations, wildlife sanctuaries, wilderness areas, mangrove reserves and parks. These lands are considered to be ecologically important terrestrial and marine areas that ought to be preserved for present and future generations. The PPs or EOs that cover these areas, however, could be cancelled or modified by a new president. More secure protection was granted to these areas with the enactment of Republic Act (RA) No. 7586 that became law in June 1992. This act provides for the establishment and management of national integrated protected area systems (NIPAS), defining scope and coverage, and other purposes. On 29 June 1992, the department issued DAO No. 25-92 for implementing the rules and regulations of RA 7586 — otherwise known as the NIPAS Act of 1992. As of 2001, the DENR has recognized 224 protected areas under NIPAS (including 137 key conservation sites), with a total area of about 3.2 million hectares. The remaining virgin forests have been awarded protected-area status, but many are in critical condition and remain threatened due to insufficient funds and lack of political will (DENR 2003). The NIPAS act gives the DENR the legal strength to preserve specific forest lands for biodiversity and other environmental services. Delegating jurisdiction of specific forest lands to NAPOCOR and PNOC also assures greater protection of these areas from forest destruction as both agencies can provide funds for protection and other needed development activities. Based on the foregoing synthesis, it can be concluded that the DENR was able to make significant improvements in some of the objectives while lagging in others. Significant strides were made in promoting equitable access to forest resources and in conserving specific terrestrial and marine areas. However, productivity, availability and sustainability of forest resources are still major problems. The challenge lies in how the efforts of forest agencies and institutions can be maximized to achieve these objectives and to ensure that the contribution of forests to social and economic development is maximized. Although the most notable re-invention of Philippine forestry agencies in recent times took place following the 1986 EDSA Revolution, in reality, the DENR has continued to re-invent itself — sometimes in small ways and sometimes in major ways — almost constantly. Many forces and individuals and have contributed to these reforms and changes, while other factors have constrained the re-invention processes. Minister Ernesto Maceda (served from February 1986 to November 1986) was the first appointed Minister of Natural Resources after the 1986 EDSA Revolution. He supported the social forestry programme by training foresters and other MNR staff in community organization and development and designated them as Community Development Officers/Assistants; he also allowed Forest Steward Associations (FOSAs) in Negros Oriental to saw lumber from dead trees within their assigned areas. The community forestry experience of the World Bank-funded CVRP was subsequently used by other community/social forestry projects. The lessons from the programmes and projects were used by the DENR for designing its CBFM programme, formalized in 1996. During his tenure, WIDA offices were decommissioned and their functions were re-assigned to the then BFD regional offices. Minister Carlos G. Dominguez (served from December 1986 to March 1987) initiated the re­organization of MNR and focused his forestry programme by supporting commercial, protection and social forestry. He encouraged the IPs of Mindoro Oriental, in one of his field trips in early 1987, to accept the Community Forestry Program at that time in the absence of a comprehensive ancestral domain programme. Unfortunately, he served the MNR for just four months. Secretary Fulgencio S. Factoran Jr. (served from April 1987 to June 1992) was the head of the MNR when EO 192 was issued in 1987 mandating the re-organization of MNR into the DENR. During his tenure the following activities were accomplished: (1) The BFD and WIDA were integrated as the FMB and made a staff bureau of the DENR, its field functions being transferred to the forestry sector/divisions/units at the RENRO, PENRO and CENRO levels; (2) PAWB was made a staff bureau and its field tasks were transferred to RENRO/PENRO/CENRO levels; (3) the FMB and PAWB directors became technical and policy advisers for the DENR secretary and the Office of the Secretary; (4) the protected areas were further strengthened by the NIPAS act in 1992; (5) a more comprehensive system was implemented for forest protection through the Monitoring and Enforcement Component (MEC) of the World Bank-assisted ENR-SECAL project that addressed both short- and long-term solutions for forest protection problems; (6) he actively participated and contributed to the drafting of the implementing rules and regulations for ENR in the Local Government Code of 1991 and R.A. 9054. Secretary Ricardo Umali (served from July, 1992 to August, 1992) was appointed Acting Secretary of the DENR for a brief period of two months. He was the first career officer from DENR to be appointed to the position of secretary. As such, he introduced science and technical aspects in forestry to the department. He espoused multiple use of the forest, particularly in the area of production and protection forestry. Secretary Angel Alcala (served from August 1992 to May 1995), a coastal and marine scientist from Silliman University, created the Coastal and Marine Management Office in DENR and launched the Coastal Environment Program. Some staff were trained in managing coastal resources including mangrove forests, while he strengthened the forestry sector as a whole. The DAO for ancestral domains was issued during his tenure. Secretary Victor O. Ramos (served from June 1995 to June 1998) was the former DENR Under­secretary for Field Operations during the tenure of Secretary Factoran. While he was DENR secretary, EO 263 was issued in July 1995 adopting CBFM as the national strategy to ensure the sustainable development of the country’s forest land resources. He signed DAO 96-29 promulgating the rules and regulations to implement EO 263, formally launching the CBFM programme. To support it, he transformed the Social Forestry Division into the CBFM office in the national office and at the regional office. He organized training for CENRO officers in all aspects of environment and natural resources management by establishing the CENRO Academy at Carranglan, Nueva Ecija. During his tenure, the Caraga Timber Corridor in Mindanao was formally launched to support the raw material needs of the wood industry. He supported the recognition of the rights of IPs and facilitated the issuance of CADCs to legitimate IPs throughout the country — a development that paved the way for the subsequent issuance of Certificates of Ancestral Domain Titles (CADTs) by the NCIP after the IPRA was enacted in 1997. Under Ramos, the DENR also provided technical assistance to the NCIP in the preparation of the Ancestral Domains Sustainable Development and Protection Plan (ADSDPP). Secretary Antonio Cerilles (served from July 1998 to January 2001) re-organized the regional operations of the DENR. He set aside the positions of regional technical directors for the forestry, lands and protected areas sectors and created assistant regional directors (AREDs) for technical services, operations, and support services, respectively. Recognizing the potential contribution of the forestry sector to national development, he provided the necessary support for the wood industry, including the administrative issuance for automatic conversion of expiring TLAs into IFMAs. Secretary Heherson Alvarez (served from February 2001 to November 2003) was a supporter of the CBFM programme and an avid believer in the positive contribution of trees and forests to address global warming. Secretary Elisea Gozun (served from December 2003 to August 2005), the only female DENR secretary, focused on rationalizing the forestry sector as a whole. She initiated the adoption and popularization of production and protection forests and corrected abuses on the granting of RUPs to CBFMA holders. She coordinated regularly with the Philippine Wood Producers Association (PWPA) officials and remained updated on best practices in industrial forestry. She shortened the processing time of permit applications and adopted the issuance of multiyear permits for forest resource use, sawmill operations, wood-based processing and lumber dealers. The multiyear permit is designed to prevent a few unscrupulous DENR staff from extorting money from applicants every time they renew their permits and at the same time is an incentive for TLA/IFMA holders and wood processors to invest more in plantation development and more efficient wood-processing plants, respectively. Secretary Michael Defensor (served from September 2005 to January 2006), the youngest Secretary of the DENR, is one of the most popular members of President Arroyo’s cabinet. Unfortunately, during his tenure (late 2004) deadly landslides and floods resulted in the loss of hundreds of lives and huge financial losses for properties and infrastructure. Illegal logging was blamed and consequently a nationwide logging ban was imposed. However an expert study revealed that the watersheds of the rivers where these disastrous floods occurred had comparatively better forest cover than other watersheds in the country. In reality, the cause was “too much rain over a short period of time” rather than logging activities. The logging ban affected the flow of legitimate wood products to users, including the multibillion peso furniture industry very badly. The suspension of cutting permits, even on planted trees, drove away potential investors and impacted negatively on tree planters who had nothing to do with the floods. The rationalization plan for the entire DENR transpired during his tenure. A controversial item in the plan allegedly was the re-merging of the FMB and PAWB, and the downgrading of the ERDB. Secretary Angelo Reyes (served from February 2006 to date) was the former Chief of Staff of the Armed Forces of the Philippines. Before his stint in the DENR, he was appointed by the President of the Philippines as the Secretary of Department of National Defense and the DILG, respectively. He considers illegal loggers and forest abusers to be environmental terrorists. His focus is strongly on forest law enforcement and forest development activities. The DENR can provide services to people at many levels through its regional offices, PENROs and CENROs. Although the number of personnel is still limited, the DENR reaches to the municipality level, through its CENROs, to provide local services related to natural resources, particularly forest resource management. The DENR’s regional and provincial level offices can assist provincial LGUs in natural resource management issues. Various laws, EOs and PPs related to natural resources give the department the legal mandate to conduct its activities. Although many of them need to be updated, modified or rescinded, they provide the DENR with the legitimacy to regulate, control, manage and develop forest resources. The laws also enable the DENR to collaborate or seek assistance from other government agencies, NGOs, POs and funding agencies at home and abroad to help pursue its objectives. Assistance from NGOs and POs for the management and protection of the country’s natural resources has become substantial over time. Collaboration and cooperation with the DENR became more pronounced in 1987 when the DENR, under leadership of Secretary Factoran, recognized their value and entered into contracts for reforestation and other forest management activities. Many development projects, although limited in scope, were implemented by the DENR with funding from agencies such as USAID, EU, CIDA and AusAID. For example, knowledge on collaborative and integrated watershed management generated by the Philippines-Canada Environment and Economic Management (PCEEM) project, funded by CIDA, has been used by the DENR to strengthen its watershed management programmes and garner additional support from the World Bank and the Asian Development Bank. Similarly, information from the USAID-funded Natural Resources Management Program (NRMP) helped the DENR to develop the Regional Resources Management Project (RRMP) project and the National Forestation Program. Lessons learned from the USAID-funded Coastal Resources Management Project (CRMP) led to effective implementation of the CBRMP by the Department of Finance and the DENR. Some NGOs and POs were also direct recipients of grants to support their NRM programmes. These funds enabled them to pursue natural resource development in their respective localities with minimal government assistance. World Neighbors in Cebu City and the Mindanao Rural Life Baptist Center in Davao del Sur are good examples. Their pioneering work in developing agroforestry technologies has contributed to the DENR’s reforestation and CBFM programmes and projects. Funding from multilateral donors has enabled the DENR to implement numerous national programmes for the development, rehabilitation or protection of forest and forest lands. The department was able to effectively monitor and conduct forest protection activities nationwide via proactive and aggressive forest law enforcement activities as well as establishing and implementing the World Bank supported Multi-Sectoral Forest Protection Committee (MFPC). The DENR also implemented the National Forestation Program (NFP) through loans provided by ADB and the Japan Bank of International Cooperation. The department was also able to implement its Regional Resource Management Project (RRMP) through funding from the World Bank. It would have been virtually impossible for the DENR to pursue these programmes and projects from its own annual budgets provided by the General Appropriations Act. Scientific and sound resource management practices conducted by conscientious logging companies have helped to sustain the country’s forest resources. Social forestry and other initiatives supported by the private sector have also helped to protect the remaining forests. Wood and forest-based industries have added much value to raw forest materials. Other government agencies like NAPOCOR and PNOC manage portions of the country’s forest estate with considerable inputs and resources, including funding. This reduces the area of forest land under direct DENR management. DENR staff have attended various international training courses and fora on forest and natural resource management; these events have enriched their capacity and inculcated new perspectives on how to apply knowledge from other countries to the Philippine context. The overarching law for forest resource management in the Philippines remains PD 705, issued 35 years ago. It is clearly not supportive of the directions of decentralization and devolution followed by the DENR. Several of its provisions are obsolete and others are not aligned with the 1987 Constitution. The DENR is greatly hampered by the absence of a comprehensive forestry law. There is an urgent need for an updated Sustainable Forest Management Bill to be enacted so that the DENR and its partners in forest protection and development can rapidly achieve their goals and objectives. Logging operations are capital intensive and require long periods before investors can recoup investment. Industrial tree plantations are also capital intensive and require cycles of eight to 25 years, depending upon site quality, management and species. Investors need to be assured that the agreements they sign with the current DENR (generally for 25 years, renewable for another 25 years) will be honoured by future officials 25 or 50 years in the future. Unfortunately, it has been common practice for DENR policies to be changed by every new incoming DENR secretary. Meanwhile, thousands of hectares of forest lands where industrial tree plantations could have been established remain denuded while the industries requiring wood and forest-based materials suffer from erratic supply of raw materials. Moreover, there are more than 5 million hectares of forest and forest land that are not covered yet by any form of tenure and hence are considered open access areas. Owing to the country’s financial difficulties, the budgets allocated to government agencies, including the DENR, have changed little over recent years. The bulk of the budget goes for personnel services, with only a modicum remaining for operating expenses and usually none for equipment or capital outlay. Personnel cannot stay in the field as required because the budget for travel and per diems is very limited. Equipment or facilities to conduct surveys as well as provision of assistance to clients or to monitor and assess programmes and projects are inadequate. Such constraints hinder the movement of personnel and the services they could provide. Many LGUs do not have the capacity to undertake forest management activities devolved to them by the DENR as mandated by the Local Government Code of 1991. They need continuous technical assistance, but to date the DENR has not been able to fully meet this need. Local communities, represented by POs (who are CBFMA holders), also require considerable assistance from the DENR. Serving as forest resource managers for millions of hectares of forest lands, POs need ongoing technical assistance. In addition, CBFMA holders should be linked to LGUs for concomitant assistance, to markets and buyers who can purchase their products at better prices and to investors or funding agencies for financial and other assistance. The DENR is constrained in providing the assistance essential to CBFMA holders. Without it, CBFMA holders may fail, with disastrous consequences for the country and the millions of hectares under their care. IPs also need to be helped with their forest management activities. Much indigenous forest management knowledge has been lost. The DENR could help the NCIP to provide forest management-related services to IPs but will require additional budgetary support. The DENR needs proactive strategies to entice potential partners to participate in its forest management activities. The DENR could schedule investors’ fora and provide appropriate and relevant data to facilitate their decision-making. Such information could also stimulate donors interested in supporting protected areas to decide where their resources would have the most impact and what NGOs or POs to partner with. The classic example is the disastrous floods and landslides that killed many people in the provinces of Southern Leyte, Aurora and Quezon. The local media sensationalized the issue and the general public asked for immediate action from government. It is very important for the general public and the media to obtain a balanced view of forests not only for their protection but also for production and economic functions. For checks-and-balances purposes, the legislative branch of the government is mandated by law to review and approve the budget of its executive branch. Congressmen and senators usually raise their constituents’ concerns with the DENR secretary during annual budget hearings, which the secretary has to address. The DENR needs to develop creative ways to address these concerns without comprising its core tasks and objectives. The prevailing disorder and lack of security in some parts of the country also adversely impacts forest management operations and various other forest development and protection activities. The licences, permits and leases that are issued are not easily available for public scrutiny suggesting corruption and a lack of transparency. The annual renewal of operational plans and permits is also a potential target for corruption. Perceived corruption could also discourage graduates of integrity from joining the DENR. Trained and accustomed to controlling forest resources and associated bureaucracy, many DENR/ FMB staff find it difficult to relinquish this control to other agencies and entities. This mindset hampers progress toward the five major objectives of good governance — decentralization, devolution, deregulation, standardization and simplification — that the DENR needs to focus on and sustain. The re-organization of the DENR, which transformed forestry agencies into staff bureaus and placed them under the supervision and control of the DENR secretary, facilitated the complementation and harmonization of previously conflicting directions of production forestry and protection forestry as espoused by the FMB and PAWB, respectively. In 1987, EO 192 mandated the re-organization of the DENR. DENR re-organization considered the emerging importance of the protection and biodiversity functions of forests. Hence, it transformed the former two existing line bureaus — the BFD and the FORI — into three staff bureaus, namely the FMB, PAWB and the ERDB. The new staff bureau — the PAWB — focused on protected areas and biodiversity conservation. As staff bureaus, they focus on providing advice and recommendations for setting standards and initiating policies for approval by the secretary. The line functions of the forestry agencies are now being exercised by the Field Operations Office, headed by the Under-secretary for Field Operations at the national level. REDs, PENROs and CENROs head the field operations groups at regional, provincial and community levels, respectively. One very important lesson learned in this re-organization was the value of harmonizing the various formerly conflicting directions of the forest agencies into one complementary direction. The staff bureaus are now required by the head of the agency (i.e. the Secretary of the DENR) to consult and agree upon acceptable solutions that will address forestry problems without sacrificing the individual mandates and functions of each bureau during field operations. In cases where staff bureaus have difficulty reaching agreement, the issues are elevated to the secretary, through the DENR management committee, for final arbitration. The allocation of forest resources under the supervision and control of government institutions does not absolve or diminish the DENR’s responsibility as the primary government agency responsible for the management of the country’s forest resources. Considerable fragmentation of the management of forest resources has resulted in the Philippines as a result of placing certain watersheds and other areas under the jurisdiction of other government institutions (e.g. the NPC and PNOC), agencies (e.g. the Armed Forces of the Philippines) and state universities (e.g. UP Land Grant universities). This has lightened the DENR’s forestry-related workload. However, as the government agency primarily responsible for the effective management of Philippine forest resources, the DENR is expected to know at any given time the status of the forest and forest land in the reservations managed by other agencies. One lesson learned in this regard is the need for the DENR to be more proactive in holding regular coordination meetings with the other mandated agencies. This places the department in a better position to be updated on the status of the reservations and to provide immediate assistance on forestry matters, if needed. The granting of autonomy, as in the case of the ARMM, can help to motivate and bring about better and faster decision-making on important forestry matters (e.g. the ARMM Sustainable Forest Management Act). When the ARMM law was passed in 1991, the national DENR turned the jurisdiction and management of forest resources in the four provinces of the ARMM to its counterpart there. This was a unique re-invention experience where personnel, budget and jurisdiction were transferred to an agency at the same level — the ARMM DENR. The national DENR consequently experienced a reduction in budget, personnel and equipment, and also four fewer provinces to cover. The national DENR was able to help the ARMM DENR develop its policies and programmes and implement its plans through the ECOGOV project. The national DENR also learned that a counterpart may succeed where it had itself failed, as in the case of the ARMM Sustainable Forest Management Act enacted in 2005 by the ARMM legislative body. The devolution of forestry powers and functions to LGUs is only effective when the concerned LGUs are convinced that devolution is good for their communities and constituents and are committed to effective implementation. In accordance with the Local Government Code of 1991, the DENR devolved its ISF programme and social forestry staff to LGUs at the provincial level. But the DENR failed to follow through with effective collaborative initiatives, especially in providing concerned LGUs with technical support and other relevant assistance on how to properly establish and operationalize the ISF programme. This failure resulted in the “loss” of many highly trained ISF staff to non-ISF activities and wasted an early opportunity to develop LGU capacity for effectively managing forests and upland resources, and maximizing their contribution to rural development. Highlighting the multiple uses of forests at planning meetings and discussions on forest management generates better appreciation and a holistic approach that reduces unnecessary conflict among major forest resource stakeholders. The creation of the PAWB as a separate staff bureau and the enhancement of protected area activities in field operations demonstrates the DENR’s commitment to global and regional thrusts in protected area management. However, the focus on establishing more protected forests should not come at the expense of the social and economic functions of the forests. Forestry agencies should always highlight the multiple uses and values of forests and the need to focus on complementarity of these uses rather than competition for them. The DENR commitment to balance between production and protection can help to harmonize the various demands from corporate forestry, the community, environmental groups and other stakeholders. Recognition of forest dwellers as de facto forest managers and support from LGUs facilitates the conservation of remaining forest resources and development of new plantations, while simultaneously addressing the issues of equity, livelihood and stability in rural areas. Executive Order 263 (1995) introduced a major re-invention opportunity for the DENR — especially in facilitating more equitable access to forest resources and greater involvement of local communities in forest management. Indeed, the DENR immediately came up with DAO 96-29 and other memorandum circulars to implement EO 263. However, owing to inadequate support from some LGUs, limitations in staff and budget, coupled with an unstable CBFM policy and guidelines, the implementation of the CBFM programme has decelerated, including the training and development of villagers as village foresters. The CBFM programme also requires considerable funding, time and skilled staff for implementation in collaboration with the POs who are awarded CBFMAs. The DENR has tapped the technical and financial assistance of NGOs and can enlist LGUs to become more accomplished at field levels. The active involvement of concerned LGUs in supervisory and collaborative work is a crucial ingredient for the success of the CBFM programme — as in the case of Nueva Viscaya. The government’s recognition and promotion of the rights of IPs may strengthen sustainable forest management practices. The passage of the IPRA law in 1997 made the earlier efforts of the DENR very useful to the NCIP, the agency created by law to implement the provisions of IPRA. The transfer of jurisdiction of ancestral domains and claims (which are mostly forest lands) from the DENR to the NCIP has reduced the direct responsibilities of the DENR on forests located within the recognized ancestral domain lands. However, as the government’s primary agency on forestry, the DENR is expected to provide needed technical assistance, especially for the management of forest resources within the ancestral domains. The DENR can pursue initiatives to help the NCIP transform the IPs into effective forest managers of their ancestral lands which is hoped to strengthen both livelihoods and cultural identity as well as the achievement of the DENR’s objectives. The DENR has undergone several processes of re-invention — especially since 1987 — that aided in achieving significant improvements related to forests and forest resources. Most notable have been advances in promoting equitable access to forest resources and in conserving specific terrestrial and marine areas. On the other hand, the department has had to race against time to conserve forest resources and rehabilitate denuded forest lands, while balancing the requirements and demands of various stakeholders. Apart from these gigantic tasks, the DENR is also challenged by significant concerns. The DENR is beset by legal, technical, financial, and human resources constraints that hinder the pursuit of its objectives. However, there are many external strengths, opportunities and resources (human, technical and financial) that it can tap to overcome some of these constraints. Opportunities exist to further improve on the current level of incentives and the policy environment to encourage and entice the private sector to participate more actively in forest management and development. Acosta, R., Miyakawa H., Francisco, G., Evangelista, R. & Gulinao, M.E. 2005. For the better future of CBFMP (a field review of 47 CBFM sites). Quezon City, DENR-JICA. Chamber of Furniture Industries of the Philippines (CFIP). 2005. Press release: CFIP appeals to Aglipay, Defensor on log ban. Pasig City, Philippines. Chamber of Furniture Industries of the Philippines, Inc.
Department of the Environment and Natural Resources (DENR). 2003. The revised master plan for forestry development. Quezon City, FMB/DENR. Lansigan, N.P. 1994. Honor roll of trailblazers in Philippine forestry. Quezon City, Philippines. 1 Renato A. de Rueda is a professional forester and was formerly the Under-secretary for Field Operations of the DENR. 2 EDSA stands for Epifanio de los Santos Avenue, a main highway in Manila and the main site of the demonstrations.